Wanna know how much The Yankee rocks? A LOT. After a few seconds of blinking and telepathic communication, we did not pass go, but went directly to the Trex. This was more our style! More sturdy than anything else in the store, and safe to use around food. So far The Kiddo and I have planted four tomato plants (because, really, what’s the point of a garden without the prospect of tomato sandwiches? ), two pepper plants, some cilantro, some basil and some strawberries. I’d love to add onions and carrots and green beans. This nifty online planner shows how many of what you can plant in a square foot (thus my semi-obsessive square foot markers… made from The Kiddo’s yarn), then gives instructions for each plant you picked. How great is that? So tell me! Do you garden? 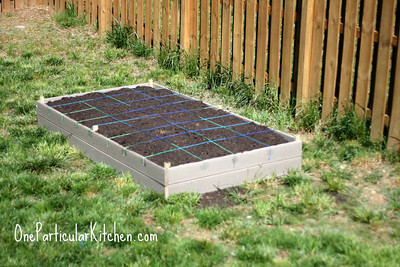 Do you have any advice, this being my first raised-bed garden? Any thoughts on how to keep away bunnies and other unwanted guests at the salad bar? Lay ’em on me! My H built us a garden too! I have a blog post ready to publish about it. We are so lucky to have such handy Hs! We have two large raised beds that we pack full of tomatoes, onions, shallots, garlic, peppers, squash, beans, okra, and of course my herbs. It’s so much fun and you will not believe how much better your freshly grown produce tastes than store-bought. Our main problem is keeping the deer out – we’ve had success with hanging/pinning dryer sheets around the garden area, and my in-laws swear by this awful-smelling spray that keeps them away. Good luck and happy harvesting!!! Rubber snakes or alligators (whatever reptile you can get at the dollar store) scare away the birds from pecking at your tomatoes. Lucky of you to have a great spot to garden! Hope you have a lot of fresh goodies this year! i am trying an herb garden in a container. 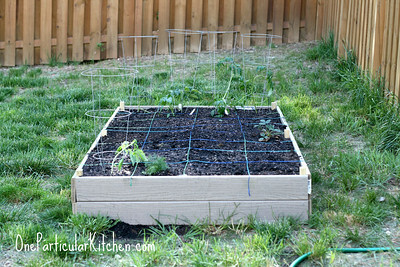 hope to move to a raised garden like this later. i am totally bookmarking this! p.s. go vols! I’m doing container gardens this year because we are still renting and not sure if we need to move in the middle of the summer. Strawberry that is blooming like MAD! What a great idea. Maybe I will try that next year. 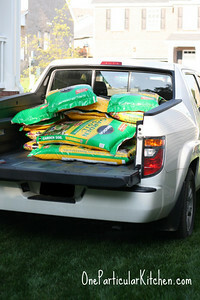 We have really sandy soil, it’s just no good for a garden. I did a container garden last year and just started it again this year. It works, but it’s limiting. This may sound a little gross, but it does work very well for rabbits and deer: some night (late) after you have had meat for a couple of days, send your husband out to pee around the borders. You could do it, but since you have someone handy who can do it more easily… Repeat about half as often as you water or it rains. The reason? It smells like a large predator lives there to garden-eating critters. Which, technically, one does.